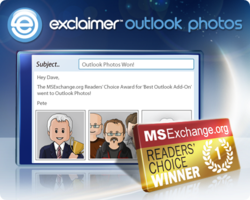 Exclaimer's free Active Directory photo software won 'Best Outlook Add-On' in the MSExchange.org Readers' Choice Awards, they announced today. 'This is the second award in six months,' said Gary Levell, CTO at Exclaimer, 'I think this isn't just about our software, it's about our users. 'The quality of our products, even if they're free, is always our highest priority - just like it is for our users. This award is theirs, maybe even more than it's ours. The software can batch-import photos to the Active Directory in a few clicks: so users see photo IDs next to colleagues' names in Outlook, SharePoint, Lync and more. The free program has nearly 3 million users worldwide and is deployed in some of the most advanced, successful companies in the world. Version 2 of Outlook Photos debuted in January with considerable fanfare, adding SharePoint and Lync integration, a new UI and other extras - Exclaimer explained. 'It's incredible to think,' Andrew Millington, Exclaimer CEO, said, 'this free product has made such an impact - we never expected it to be so popular. 'It might be because we offered the same level of Exclaimer quality with it, regardless of its price, or lack of it. Users trust it.